As an official European Union Regulatory Agency, the European GNSS Agency (GSA) manages public interests related to European GNSS programs. The GSA’s mission is to support European Union objectives and achieve the highest return on European GNSS investment, in terms of benefits to users and economic growth and competitiveness. The organization has just released their European GNSS Agency’s (GSA) 2017 GNSS Market Report, which offers an in-depth look at market opportunities and trends within the dynamic Location Based Services (LBS) segment. The global GNSS market is expected to grow from 5.8 billion devices in use in 2017 to an estimated 8 billion by 2020. Today, nearly 3 billion mobile applications already rely on GNSS-based positioning information, including smartphones, tablets, tracking devices, digital cameras, portable computers and fitness gear. According to the 5th edition of the GSA’s popular GNSS Market Report, the extraordinary growth of GNSS in the LBS segment is set to continue. 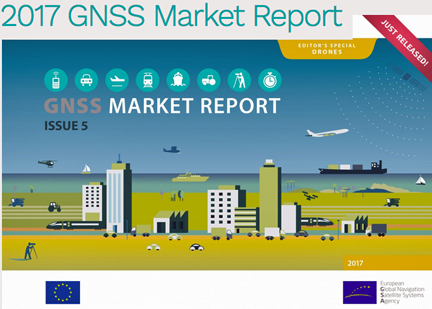 The GSA GNSS Market Report is compiled by the GSA and the European Commission and was produced using the GSA’s systematic Marketing Monitoring and Forecasting Process. The underlying market model uses advanced forecasting techniques applied to a wide range of input data, assumptions, and scenarios to forecast the size of the GNSS market in terms of shipments, revenue, and installed base of receivers.